Publishers large and small from across America, Canada, and Mexico compete for the coveted Benjamin Franklin Award named in honor of America's most cherished printer and publisher. Celebrated at a gala awards ceremony on Broadway in New York in 2005, Lucky Stars and Gold Bars was judged the second strongest book in the genre of Autobiography/Biography/Memoirs by a panel of more than 155 book industry experts from the very markets in which the books compete, such as buyers at wholesale and retail levels, librarians, book critics, design experts, and publishing consultants. Judged for achieving its purpose and meeting its intended audience's needs as well as for excellence in editorial and design, Lucky Stars and Gold Bars received a perfect score of 10 in eleven elements of editorial evaluation and a near perfect score in fourteen elements of design, including raving comments such as "Fabulous" and "Stunning." Lucky Stars and Gold Bars is chicken soup for the soul for baby boomers who want to better understand and connect with their parents' war and pay the debt of gratitude owed them. Lucky Stars And Gold Bars: A World War II Odyssey is a 522-page distillation of some 400 letters written by Lyle Sladek, a South Dakota farm boy during his military service as a second lieutenant in the Army Air Corps. Lyle served as a Cryptographic Security and Intelligence Officer in the China-Burma-India; European; and Mediterranean theaters of war. He wrote about his observations respecting profound socioeconomic changes in Asia and Europe posting his letters home from five continents. Compiled and edited by his daughter, Lucky Stars And Gold Bars is especially valuable in what it reveals about the noncombat side of military life "in the field" during World War II as experienced by four out of five GIs during the second world war. Enhanced with 236 illustrations and thoroughly "reader friendly", Lucky Stars And Gold Bars is a rather unique and enthusiastically recommended addition for personal, academic, and community library Military History & Biography collections. Through the preservation of written words, war mementos, and documents, Lucky Stars and Gold Bars relates for future generations an accurate account of the sacrifices made on the Home Front and the roles service people played in WWII. It reflects the daily life, the humor, the romance, and the heartache of the era. Karen Sladek, award-winning author of LUCKY STARS & GOLD BARS: A World War II Odyssey, published 7 Dec 2004. See: http://www.luckystarsandgoldbars.com "Lyle discovered the �beautiful world of mathematics� and, at the age of 17, set off for Brookings, South Dakota to enroll in engineering at the State College in the fall of 1941. Lyle had barely cracked open his freshman textbooks when the surprise attack at Pearl Harbor turned his world upside down. One year later, Congress lowered the draft age to 18 and Lyle became subject to being called up. While considering his options, he came across a brochure on the physics department bulletin board�the Air Corps was looking for college students with a background in physics and mathematics. Lured by travel and adventure, Lyle applied. The excitement and glamour of airplanes fired his imagination." Perhaps more importantly, the book has a reader to take action. It has prompted Myrt to ask different questions of her father about his WWII military experience during her upcoming visit in about a month. For instance, I've heard of victory gardens, but never thought to ask if Dad's mom had one. I didn't ask Dad where he was when he heard about the bombing of Pearl Harbor, or what his mother (my Grandma Myrtle) said to him in letters back and forth while he was in the service. What were his favorite songs of the era? What did he do on furlough? THANKS to this marvelous book, Ol' Myrt has some background and a place to start the conversation with dear ol' Dad! Even though Karen Sladek's father & his six brothers all fought in various theaters of WWII, demobbed & back home in peacetime, they never talked about their travels or experiences during family gatherings. Accustomed to this silence, Karen grew up knowing little, other than a brief mention in a high school class, about the global conflict her parents, two of The Greatest Generation, survived. It all started when the Berlin Wall fell in 1989 & Karen Sladek & her best-friend, also named Karen, decided to trace their roots by traveling to the newly reopened Eastern Europe -- Poland, East Germany & the Czech Republic. In Prague they spent a night talking with their landlady, the first person to truly bring the Second World War alive for these two American Baby Boomers. Then Karen's best friend wanted to find her mother's birthplace, somewhere in what had been Czechoslovakia. With a letter of introduction from their Prague landlady, they did find a relative &, with a translator, found comfort in getting a glimpse of what their grandparents had gone through to give their children the American Dream. At the same time Karen Sladek began to realize what her father had done to preserve her freedom. Luckily for us, Lt. Lyle Sladek came from a family who wrote letters & saved them in their envelopes, together with postcards, snapshots & all sorts of memorabilia. They are the source for this epic labor of love, which at 522, is much, much more than a mere recording of her father's letters. To better fill in the gaps, Karen Sladek adds historical perspectives with excerpts from President Roosevelt's wartime speeches, sections of other wartime events, narratives about life back on the farm in South Dakota, & the happenings of other family members. Lucky Stars and Gold Bars also includes many photographs of both her mother & father's immigrant parents dating back to 1895 when they first arrived in Dakota Territory, the building of farmhouses, family, school & college groups, as well as the snapshots from her father's odyssey around the world in the Army Air Corps as an Intelligence Officer & Cryptographer. Lucky Stars and Gold Bars, with song titles & various sayings from that time as chapter headings, is chockful of the adventures, thoughts & language of one ordinary American youth who was swept up into an extraordinary era. An outstanding time warp! Lucky Stars and Gold Bars: A World War II Odyssey won a 2005 Benjamin Franklin Award. I always get a little envious when my genealogy friends talk about the letters and journals handed down in their families. Why couldn't my family have been so prolific with their pens? 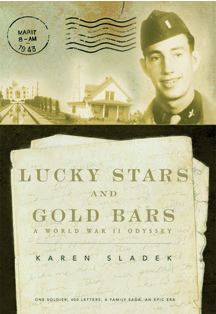 The desire to read about my ancestors' thoughts and feelings is one reason I was so taken with author Karen Sladek's book, Lucky Stars and Gold Bars: A World War II Odyssey. The idea for the book was born when Sladek discovered a box of 400 letters her dad wrote during World War II. (Lucky lady!) This unexpected find prompted Sladek to write Lucky Stars, in an effort to chronicle her dad's journey, as well as share the letters with other people interested in the WWII era. Using her dad's letters, as well as photographs and other documents, Sladek wrote Lucky Stars and Gold Bars�the journey of young Lyle Sladek from a South Dakota farm boy to an officer in the Army Air Corps' Cryptographic Security and Intelligence section. In all, Lyle saw duty in the European, Mediterranean and China-Burma-India theaters of war, all the while describing everyday life in his letters home. He wrote about baseball, exercise, the food and the rapidly changing world around him, both in Europe and Asia. Lyle's letters begin in January, 1941, and end May 18, 1946, as he returned home from Italy. His own evolution from a naive youth is evidenced in his writings. For example, the 1946 Lyle had a far more mature world-view than the 1941 man who wrote, "Well Japan has attacked Honolulu but I think Japan will be licked within a week." I enjoyed reading Lyle's account of service life, partly because my own dad served in World War II, and I'm sure he would have shared many of Lyle's observations. If you or someone in your family experienced the WWII years, I think this is a book you'd enjoy having in your personal library. Lucky Stars and Gold Bars (weighing in 500-plus pages) is available at your local bookseller, Amazon.com, or direct from the author. Nancy Hendrickson is a contributing editor for Family Tree Magazine. She also is a family historian, freelance writer and the author of two astronomy books. Her Web site is at www.ancestornews.com. E-mail her at stjoemo@pobox.com. Five years ago Karen Sladek of Bainbridge Island, Wash., came to her parents' home on the campus of California Lutheran University to help them prepare an estate plan. During that process, she rummaged through their belongings, including old paperwork and documentation. Tucked inside her dad's den closet, she found a cardboard box he had stashed 25 years earlier. It was filled with 400 letters he had written to his family during World War II. Little did she realize that she had discovered a treasure trove, the core of a book she would publish this year titled "Lucky Stars and Gold Bars: A World War II Odyssey." The 400 letters anchor the book with Karen adding commentary throughout on her father's growing-up years, and putting the letters in context with war events. Her father, Lyle Sladek, who retired in 1994 after teaching math at Cal Lutheran for 31 years, told Karen he had found the box some 30 years after the war, following the death of his parents. He had put the letters in the closet intending to read them when he had time. He never found the time. "Something snapped inside of me," said Karen, 47. "I also felt some shame that I hadn't talked to him about his World War II experiences before then. I told him I wanted to read the letters. "He sat me down in his chair, the place of honor, and he set up a reading light for me, which was really sweet, which is Dad's way. And I began to read." She read and read and read. She called her husband, Norm Ferguson, back on Bainbridge Island and told him she would be a week late. When she finished the last letter, she was totally fascinated. "I said, 'Dad, this would make an incredible movie,'" she said. "He had had so many studies, so many experiences. By the time he was 21, he had circled the globe, been to all the major cities we dream about. It really struck me that until I read his letters I had had no idea of what he had done. "Oh, I knew he had been overseas, we have some artifacts. But to this day I wonder why I didn't know more about him until I read those letters. This is the part that makes me cry. I meet so many other people doing the same thing, only I was fortunate to find the letters and talk to him while he is still alive. Other people wish they could talk to their parents, but most of them are gone." For his part, Lyle Sladek, 80, is proud of how his daughter put together the book. "She put in the letters almost verbatim," he said. "I pointed out to her some bad spelling and punctuation, but she left them in. I'm very grateful to her for doing the book. I think World War II history should be passed along to people. It might be of benefit in the future. You go to the movies and you get the screenwriter's imagination and embellishments, but in the book you get what I saw at that time." The letters begin Jan. 21, 1941, actually on a penny postcard, when he was a senior at Chamberlain High School in Chamberlain, S.D., 15 miles from the family farm in Pukwana. The untrustworthy dirt roads meant he had to live in Chamberlain. The letters end May 18, 1946, as he prepared to debark from Italy back to the United States and trade his Army uniform for civvies. In between, Sladek regaled his family with observations such as Dec. 7, 1941's "Well Japan has attacked Honolulu but I think Japan will be licked within a week"; from boot camp at Miami Beach March 23, 1943, "One of the fellows name is Yokum so we call him Lil Abner. He and another fellow are going to eat a jar of olives tonite. There is a group singing a popular song in the other wing, 'You are my Sunshine'"; and from India on June 17, 1945, "For the past few years it has been my ambition to 'fly the Hump' and I believe tomorrow I'll get the chance. Will be fun to see a bit of China too. Want to go along?'" Sladek's job at the Army camp in Assam, India, was officer-in-charge of the cryptographic station. "I had to make sure there was no breach of security," he said in a recent interview. "If there was a breach, all the codes around the world would have to be changed. We had no breaches. Our men were well trained and conscientious. Not even the commanding officer of the base was allowed into the coding station without authorization." Though his job kept him on the base, he did get to make two dangerous flights over and in between the peaks of the Himalayas (the Hump) aboard a C-46 cargo plane ferrying supplies to China. Back in the United States he had taken some flying lessons and one of his biggest thrills of the war was being allowed to pilot a C-46 for about an hour on one of the trips. On V-J Day, Aug. 15, 1945, he wrote to his sister, Irene: "Say, this world of ours sure looks pretty bright doesn't it. Can you imagine a carefree existence again. And from now on it's, 'Hey Bud, don't you know there isn't a war on?'" Returning home, Sladek took advantage of the GI Bill and returned to South Dakota State College, where he had begun studying engineering five years earlier. His Army training in pre-meteorology, communications and cryptology contributed to his changing his major to mathematics. He taught the subject at high schools, then received a master's degree in mathematics education from Stanford University in 1963 and came to CLU that fall. At SDSC he met a striking blonde, Patricia Knotts, and it wasn't long before romance bloomed. They were married in 1948. Patricia worked as a registered nurse for several years before retiring to take care of her growing family of four daughters. It took Karen Sladek almost five years to pull the book together. The title "Lucky Stars and Gold Bars" reflects her father's feelings that he was very fortunate in his wartime experiences. He felt he had many opportunities that contributed to sparing his life and, though he was in the China-Burma-India combat theater, he was never in a firefight. The "Gold Bars" refers to his rank of lieutenant, even though he was a first lieutenant with silver bars when he was discharged. Karen Sladek shares her father's correspondence from World War II. Dusty letters in a cardboard box made history come alive for Karen Sladek. The first-time author�s tribute to her father is �Lucky Stars and Gold Bars,� a history based on Lyle Sladek�s letters home during World War II. But she found herself as an author after she moved to the island from Kirkland in 1996 and quit her job as administrator of the University of Washington�s Center for AIDS and STD a year later. The answer came when she went home to Thousand Oaks, Calif., to help her parents work out an estate plan. Sorting through their possessions from the past 60 years, she discovered a cardboard box on a closet shelf. She was stunned to find letters her father had written during World War II � 400 correspondences posted from five continents by the young Army Air Corps Lieutenant. Her first response, she admits, was an interior grumble: �Who�s got the time?� She was, she recalls, hurrying to get the estate plan finished and get back to work. But when she began to read the missives, she found the time well-spent. In fact Sladek, who had always hated reading history because �it didn�t attach emotion to facts� was soon captivated � both by the personal story of her father whose early adulthood she had never thought to imagine, and the larger story of a war she had believed had no relationship to her own life. Sladek decided to publish the letters in book form. She would collaborate with her father to reconstruct the story. The most important consideration, she says, was to offer her father�s story to a wider readership. �I decided I had a responsibility to make this history available to the public, using my father�s letters, and the family story as a vehicle to personalize the war and how it really was for Americans at that time,� she said. The book, like the letters, focuses on the life of the noncombatant soldier. Lyle Sladek � serving as a cryptographic security and intelligence officer in the China-Burma-India, European and Mediterranean theaters � who writes to his family on the South Dakota farm where he was raised. Having earned the gold bars of a second lieutenant, he moves without mishap through the war zones, blessed by the �lucky stars� of the book�s title. An intelligent man, with powers of observation heightened by training, he writes not only about his immediate circumstances, but about the broader implications of the conflict - the dissolution of the British Emprie in India, and the growing supremacy of Mao Tse Tung over the Nationalist forces of Chiang Kai-Shek. The dual perspective of the letters may hook even readers of history who prefer the distance of third-person narrative to the close lens of biography. Despite his depth of his understanding, one is also reminded that those living the experience had no idea how the tale would end; soon after June 6, 1944, D-day, Sladek penned his belief that Hitler would soon surrender in the wake of the Allied invasion. A plethora of photos support the story, and Karen Sladek provides historical context for the letters, but the perspective is her father�s. Although her father and six uncles served in the Armed Forces during World War II, Karen Sladek rarely heard them speak of their trials and experiences. History studies in high school and college gave her little insight into the conflict that transformed the world. The book documents the South Dakota farm boy�s rise from private to cadet to lieutenant in the Army Air Corps. He served as a Cryptographic Security and Intelligence Officer in three theaters of war: China-Burma-India, Europe and the Mediterranean. He walked through Shanghai shortly after the Japanese army had evacuated the Chinese city, and saw riots in India caused by Mahatma Gandhi and the Indian National Congress agitating for independence from the British. The first-hand experiences of Sladek�now retired from being a math professor at California Lutheran University�will help people understand the struggles of the so-called �Greatest Generation,� writes his daughter. The letters�though censored at the time�touch upon many aspects of military life: food (�Wonder of wonders, we had apple pie for dinner!�); military rules (I�m restricted this weekend on account of flunking an Infantry Drill Regulation Test. Just another of the little things that they use to try to beat you down�); and international events (�News has come through that Mussolini has quit. Things may move fast from now on. Any drastic change in government like that makes me think the war will soon be over�). Along with his travels overseas during the war, Sladek documents his military studies throughout the United States. Bainbridge resident Karen Sladek recently published a collection of 400 letters written by her father during his service in World War II. The letters, found in a cardboard box on the shelf of a closet in her parents� home, prompted Sladek to explore a part of her father�s life she never had been aware of before. And, like many other members of the generation that fought World War II, Sladek�s father never had dwelled on those times or talked much with his children about his experiences. From reading his letters home to his family in South Dakota, Sladek learned that her father progressed from private to lieutenant in the Army Air Corps and became a cryptographic security and intelligence officer who served in three war theaters, Mediterranean, Europe and China-Burma-India during the later years of the war and the post-war period. He was eyewitness to the mass civil disobedience led by Gandhi in India against British rule. Sladek�s grandparents saved every letter they received from their son during his military career. Sladek�s father discovered them after his parents died 30 years later. Sladek discovered the cardboard box full of letters as an adult. In her preface to the book, Sladek says compiling the letters gave her insight into WWII and into the chain of historic events�the Cold War, the Korean War and the war in Vietnam�that shaped her world as she grew up. Her father�s letters brought history alive as no history class had ever done.